This That and the Other Thing: Dessert Time! Nutella, chocolate hazelnut spread, is all the rage in Italy; "Nutellaphiles" eat it by the spoonful right out of the jar. And that may be as good tasting as it gets unless you decide to make these puff pastry tartlets. Nutella, mixed with mascarpone cheese and spread on top of banana slices in ready-made puff pastry is one of the easiest desserts I know. Roll out the sheet of puff pastry onto a clean work surface and into a 12 X 14-inch rectangle; cut out four 6-inch circles from the rolled dough. Press and line each of the circles into four individual 3-inch tartlet pans with removable bottoms. Place the tartlet pans on a baking sheet and poke each shell with a fork all over the surface to prevent puffing while baking. Bake the tartlet shells for 7 to 8 minutes, or until they are nicely browned. Remove the tartlet pans from the oven and allow them to cool completely. In a medium bowl use a hand mixer to whip the Nutella and mascarpone together with the sugar until well blended. 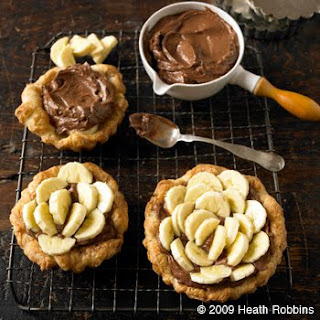 Place a layer of banana slices in the bottom of each cooled tartlet shell, then spoon the Nutella mixture into the shells. Refrigerate for several hours before serving. 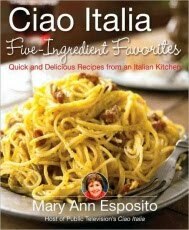 Unlike many modern cookbooks, this one does not give nutritional information. My guess is that with this recipe, that's a good thing. Enjoy. I told Mike about this one. I now have a husband purring in the corner. Guess I know what I'm making for Christmas!